During his reign, Henry IV worked through his faithful right-hand man, the minister Maximilien de Béthune, Duke of Sully, to regularize state finance, promote agriculture, drain swamps, undertake public works, and encourage education. He established the Collège Royal Henri-le-Grand in La Flèche (today the Prytanée Militaire de la Flèche). He and Sully protected forests from further devastation, built a system of tree-lined highways, and constructed bridges and canals. He had a 1200-metre canal built in the park at the Château Fontainebleau (which may be fished today) and ordered the planting of pines, elms, and fruit trees. He used one construction project to attract attention to his power. When building the Pont-Neuf, a bridge in Paris, he placed a statue of himself in the middle. The King restored Paris as a great city, with the Pont Neuf, which still stands today, constructed over the river Seine to connect the Right and Left Banks of the city. Henry IV also had the Place Royale built (since 1800 known as Place des Vosges), and added the Grande Galerie to the Louvre Palace. More than 400 metres long and thirty-five metres wide, this huge addition was built along the bank of the Seine River. At the time it was the longest edifice of its kind in the world. King Henry IV, a promoter of the arts by all classes of people, invited hundreds of artists and craftsmen to live and work on the building's lower floors. This tradition continued for another two hundred years, until Emperor Napoleon I banned it. The art and architecture of his reign have become known as the "Henry IV style" since that time. King Henry's vision extended beyond France, and he financed several expeditions of Pierre Dugua, Sieur de Monts and Samuel de Champlain to North America. France lay claim to New France (now Canada). 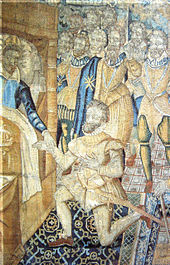 During the reign of Henry IV, rivalry continued among France, the Habsburg rulers of Spain, and the Holy Roman Empire for the mastery of Western Europe. The conflict was not resolved until after the Thirty Years' War. During Henry's struggle for the crown, Spain had been the principal backer of the Catholic League, and it tried to thwart Henry. Under the Duke of Parma, an army from the Spanish Netherlands intervened in 1590 against Henry and foiled his siege of Paris. Another Spanish army helped the nobles opposing Henry to win the Battle of Craon against his troops in 1592. 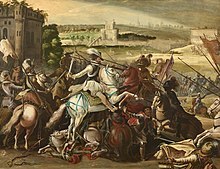 After Henry's coronation, the war continued because there was an official tug-of-war between the French and Spanish states, but after victory at the Siege of Amiens in September 1597 the Peace of Vervins was signed in 1598. This enabled him to turn his attention to Savoy, with which he also had been fighting. Their conflicts were settled in the Treaty of Lyon of 1601, which mandated territorial exchanges between France and the Duchy of Savoy. 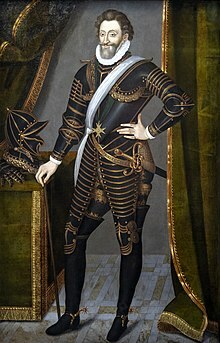 In 1609 Henry's intervention helped to settle the War of the Jülich Succession through diplomatic means. It was widely believed that in 1610 Henry was preparing to go to war against the Holy Roman Empire. The preparations were terminated by his assassination, however, and the subsequent rapprochement with Spain under the regency of Marie de' Medici. Even before Henry's accession to the French throne, the French Huguenots were in contact with Aragonese Moriscos in plans against the Habsburg government of Spain in the 1570s. Around 1575, plans were made for a combined attack of Aragonese Moriscos and Huguenots from Béarn under Henry against Spanish Aragon, in agreement with the king of Algiers and the Ottoman Empire, but this project floundered with the arrival of John of Austria in Aragon and the disarmament of the Moriscos. In 1576, a three-pronged fleet from Constantinople was planned to disembark between Murcia and Valencia while the French Huguenots would invade from the north and the Moriscos accomplish their uprising, but the Ottoman fleet failed to arrive. After his crowning, Henry continued the policy of a Franco-Ottoman alliance and received an embassy from Sultan Mehmed III in 1601. In 1604, a "Peace Treaty and Capitulation" was signed between Henry IV and the Ottoman Sultan Ahmet I. It granted numerous advantages to France in the Ottoman Empire. In 1606–07, Henry IV sent Arnoult de Lisle as Ambassador to Morocco to obtain the observance of past friendship treaties. An embassy was sent to Tunisia in 1608 led by François Savary de Brèves. During the reign of Henry IV, various enterprises were set up to develop trade with faraway lands. In December 1600, a company was formed through the association of Saint-Malo, Laval, and Vitré to trade with the Moluccas and Japan. Two ships, the Croissant and the Corbin, were sent around the Cape of Good Hope in May 1601. One was wrecked in the Maldives, leading to the adventure of François Pyrard de Laval, who managed to return to France in 1611. The second ship, carrying François Martin de Vitré, reached Ceylon and traded with Aceh in Sumatra, but was captured by the Dutch on the return leg at Cape Finisterre. François Martin de Vitré was the first Frenchman to write an account of travels to the Far East in 1604, at the request of Henry IV, and from that time numerous accounts on Asia would be published. From 1604 to 1609, following the return of François Martin de Vitré, Henry developed a strong enthusiasm for travel to Asia and attempted to set up a French East India Company on the model of England and the Netherlands. On 1 June 1604, he issued letters patent to Dieppe merchants to form the Dieppe Company, giving them exclusive rights to Asian trade for 15 years. No ships were sent, however, until 1616. In 1609, another adventurer, Pierre-Olivier Malherbe, returned from a circumnavigation of the globe and informed Henry of his adventures. He had visited China and India, and had an encounter with Akbar. Si Dieu me prête vie, je ferai qu'il n'y aura point de laboureur en mon royaume qui n'ait les moyens d'avoir le dimanche une poule dans son pot! This statement epitomises the peace and relative prosperity which Henry brought to France after decades of religious war, and demonstrates how well he understood the plight of the French worker and peasant farmer. This real concern for the living conditions of the "lowly" population—who in the final analysis provided the economic basis for the power of the king and the great nobles—was perhaps without parallel among the kings of France. Following his death Henry would be remembered fondly by most of the population. Henry's forthright manner, physical courage, and military successes also contrasted dramatically with the sickly, effete languor of the last Valois kings, as evinced by his blunt assertion that he ruled with "weapon in hand and arse in the saddle" (on a le bras armé et le cul sur la selle). He was also a great philanderer, fathering many children by a number of mistresses. Henry was nicknamed "the Great" (Henri le Grand), and in France is also called le bon roi Henri ("the good king Henry") or le vert galant ("The Green Gallant", for his numerous mistresses). In English he is most often referred to as Henry of Navarre. Henry was the subject of numerous attempts on his life. One by Pierre Barrière in August 1593 and Jean Châtel in December 1594. He was finally killed in Paris on 14 May 1610 by a Catholic fanatic, François Ravaillac, who stabbed him in the Rue de la Ferronnerie. Henry's coach was stopped by traffic congestion related to the Queen's coronation ceremony, as depicted in the engraving by Gaspar Bouttats. Hercule de Rohan, duc de Montbazon, was with him when he was killed; Montbazon was wounded, but survived. Henry was buried at the Saint Denis Basilica. His widow, Marie de' Medici, served as regent for their nine-year-old son, Louis XIII, until 1617. The reign of Henry IV was long remembered by the French people. A statue was erected in his honour at the Pont Neuf in 1614, four years after his death. 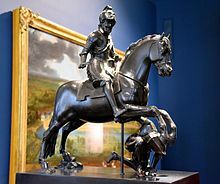 Although this statue—along with other royal monuments—was torn down during the French Revolution, it was the first to be rebuilt, in 1818, and it stands today on the Pont Neuf. A cult surrounding the personality of Henry IV emerged during the Bourbon Restoration. The restored Bourbons were keen to play down the controversial reigns of Louis XV and Louis XVI, and instead lauded the reign of the benevolent Henry IV. The song Marche Henri IV ("Long Live Henry IV") was popular during the Restoration. 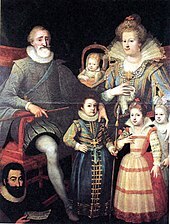 In addition, when Princess Caroline of Naples and Sicily (a descendant of his) gave birth to a male heir to the throne of France seven months after the assassination of her husband Charles Ferdinand, Duke of Berry, by a Republican fanatic, the boy was conspicuously named Henri in reference to his forefather Henry IV. The boy was also baptised in the traditional way of Béarn/Navarre, with a spoon of Jurançon wine and some garlic, imitating the quaint manner in which Henry IV had been baptised in Pau. 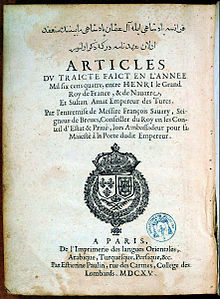 Henry IV's popularity continued when the first edition of his biography, Histoire du Roy Henry le Grand, was published in Amsterdam in 1661. It was written by Hardouin de Péréfixe de Beaumont, successively bishop of Rhodez and archbishop of Paris, primarily for the edification of Louis XIV, grandson of Henry IV. A translation into English was made by James Dauncey for another grandson, King Charles II of England. An English edition was published at London in 1663. Henry served as the loose inspiration behind Ferdinand, King of Navarre in William Shakespeare's Love's Labour's Lost. Henry's patriline was his line of descent in the male line, that is, from father to son only. Patrilineal descent governs membership and succession in many royal and noble houses. Henry was a scion of the House of Bourbon, which was a branch of the Capetian dynasty, which sprang from the Robertians. Henry's patriline ran through the house of Bourbon-Vendôme (Counts and then Dukes of Vendôme), descended from a younger son of the Count of Marche, descended from a younger son of the Duke of Bourbon, whose father was a younger son of Louis IX. Louis was the direct descendant of Hugh Capet, who became King of France in 987 and made the crown hereditary. Hugh was the heir of the "Robertian" house, Counts of Worms, descended from Robert of Hesbaye. This line has continued to the present day, more than 1,200 years in all, through kings of France, Navarre, France again, Spain, Portugal, and the Two Sicilies, dukes of Parma, grand dukes of Luxembourg, princes of Orléans, and emperors of Brazil. It is one of the oldest royal patrilines in Europe. Historians have been making the assertion that Henry IV was a convinced Calvinist, only changing his formal religious allegiance to adjust, suit or achieve his political goals. Henry IV was baptized a Roman Catholic on January 5, 1554. He was raised Reformed by his mother Jeanne III of Navarre. In 1572, after the massacre of French Calvinists, he was forced by Catherine de' Medici and other powerful Roman Catholic royalty to convert. In 1576, as he managed to escape from Paris, he abjured Roman Catholicism and returned to Calvinism. In 1593, in order to become King of France rather than by his own beliefs, he converted again to Roman Catholicism. Although a formal Roman Catholic, he valued his Calvinist upbringing and was tolerant toward the Huguenots until his death in 1610, and issued the Edict of Nantes which granted many concessions to them. ^ a b c d e f Harris, Carolyn (August 2017). "The Queen's land". Canada's History. 97 (4): 34–43. ISSN 1920-9894. ^ Ritter, Raymond; Tapié, Victor-Lucien. "Henry IV, King of France". Encyclopedia Britannica. Retrieved 19 August 2018. ^ G. de Berthier de Savigny in his Histoire de France (1977 p. 167) claims that the Calvinists in revenge attributed the phrase to him. ^ R. J. Knecht, The French Civil Wars, 1562-1598, (Routledge, 2013), 270. ^ Jones, Colin (20 October 1994). The Cambridge Illustrated History of France (1st ed.). Cambridge University Press. p. 160. ISBN 978-0-521-43294-8. ^ Bosworth, Clifford Edmund (1 January 1989). ',The Encyclopaedia of Islam: Fascicules 111–112 : Masrah Mawlid', Clifford Edmund Bosworth, p. 799. ISBN 978-9004092396. Retrieved 19 December 2010. ^ Kaplan, Benjamin J; Kaplan, Benjamin J; Emerson, Michael O (2007). ',Divided by faith', Benjamin J. Kaplan, p. 311. ISBN 9780674024304. Retrieved 19 December 2010. ^ L. P. Harvey (15 September 2008). Muslims in Spain, 1500 to 1614. p. 343. ISBN 9780226319650. Retrieved 19 December 2010. ^ a b c Newton, Arthur Percival (1936). The Cambridge History of the British Empire', p. 61. Retrieved 19 December 2010. ^ a b c d Lach, Donald F; Van Kley, Edwin J (15 December 1998). Asia in the Making of Europe. p. 393. ISBN 9780226467658. Retrieved 19 December 2010. ^ A history of modern India, 1480–1950, Claude Markovits p. 144: The account of the experiences of François Martin de Vitré "incited the king to create a company in the image of that of the United Provinces"
^ Knecht, Robert J. The Murder of le roi Henri, History Today. May 2010 issue. ^ Robert Knecht, Renaissance France, genealogies; Baumgartner, genealogicl tables. Baird, Henry M. (1886). The Huguenots and Henry of Navarre (2 volumes). New York: Charles Scribner's Sons. Vol. 2 (copies  1 &  2) at Google Books. Baumgartner, Frederic J. (1995). France in the Sixteenth Century. London: Macmillan. ISBN 978-0-333-62088-5.
de La Croix, Rene; de Castries, Duc (1979). The Lives of the Kings & Queens of France. New York: Alfred A. Knopf. ISBN 978-0-394-50734-7. Dupuy, Trevor N.; Johnson, Curt & Bongard, David L. (1995). The Harper Encyclopedia of Military Biography. Castle Books. ISBN 978-0-7858-0437-6. Holt, Mack P. (2005). The French Wars of Religion, 1562–1629. Cambridge: Cambridge University Press. ISBN 978-0-521-83872-6. Knecht, R. J. (1998). Catherine de' Medici. London; New York: Longman. ISBN 978-0-582-08241-0. ——— (2002). The French Religious Wars, 1562–1598. Oxford: Osprey. ISBN 978-1-84176-395-8. ——— (2001). The Rise and Fall of Renaissance France, 1483–1610. Oxford: Blackwell. ISBN 978-0-631-22729-8. Merlin, Paolo (2010). A 400 anni dai Trattati di Bruzolo. Gli equilibri europei prima e dopo i Trattati. Susa: Segusium (association). Moote, A. Lloyd (1991). Louis XIII, the Just. Berkeley: University of California Press. ISBN 978-0-520-07546-7. Briggs, Robin (1977). Early Modern France, 1560–1715. Oxford: Oxford University Press. ISBN 978-0-19-289040-5. Bryson, David M. (1999). Queen Jeanne and the Promised Land: Dynasty, Homeland, Religion and Violence in Sixteenth-century France. Leiden and Boston MA: Brill Academic. ISBN 978-90-04-11378-7. Buisseret, David (1990). Henry IV, King of France. New York: Routledge. ISBN 978-0-04-445635-3. Cameron, Keith, ed. (1989). From Valois to Bourbon: Dynasty, State & Society in Early Modern France. Exeter: University of Exeter. ISBN 978-0-85989-310-7. Finley-Croswhite, S. Annette (1999). Henry IV and the Towns: The Pursuit of Legitimacy in French Urban Society, 1589–1610. Cambridge: Cambridge University Press. ISBN 978-0-521-62017-8. Frieda, Leonie (2005). Catherine de Medici. London: Phoenix. ISBN 978-0-7538-2039-1. Greengrass, Mark (1984). France in the Age of Henri IV: The Struggle for Stability. London: Longman. ISBN 978-0-582-49251-6. Lee, Maurice J. (1970). James I & Henri IV: An Essay in English Foreign Policy, 1603–1610. Urbana: University of Illinois Press. ISBN 978-0-252-00084-3. LLoyd, Howell A. (1983). The State, France, and the Sixteenth Century. London: George Allen and Unwin. ISBN 978-0-04-940066-5. Lockyer, Roger (1974). Habsburg and Bourbon Europe, 1470–1720. Harlow, UK: Longman. ISBN 978-0-582-35029-8. Love, Ronald S. (2001). 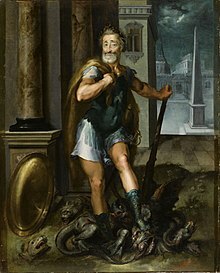 Blood and Religion: The Conscience of Henri IV, 1553–1593. Montreal: McGill-Queen's University Press. ISBN 978-0-7735-2124-7. Major, J. Russell (1997). From Renaissance Monarchy to Absolute Monarchy: French Kings, Nobles & Estates. Baltimore: Johns Hopkins University Press. ISBN 978-0-8018-5631-0. Mousnier, Roland (1973). The Assassination of Henry IV: The Tyrannicide Problem and the Consolidation of the French Absolute Monarchy in the Early Seventeenth Century. Translated by Joan Spencer. London: Faber & Faber. ISBN 978-0-684-13357-7. Pettegree, Andrew (2002). Europe in the Sixteenth Century. Oxford: Blackwell. ISBN 978-0-631-20704-7. Pitts, Vincent J. (2009). Henri IV of France: His Reign and Age. Baltimore: The Johns Hopkins University Press. ISBN 978-0-8018-9027-7. Salmon, J. H. M. (1975). Society in Crisis: France in the Sixteenth Century. London: Ernest Benn. ISBN 978-0-510-26351-5. Sutherland, N. M. (1973). 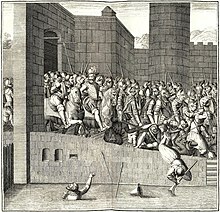 The Massacre of St. Bartholomew and the European Conflict, 1559–1572. London: Macmillan. ISBN 978-0-333-13629-4. ——— (1980). The Huguenot Struggle for Recognition. New Haven: Yale University Press. ISBN 978-0-300-02328-2. ——— (1984). Princes, Politics and Religion, 1547–1589. London: Hambledon Press. ISBN 978-0-907628-44-6. ——— (2002). Henry IV of France and the Politics of Religion, 1572–1596. 2 volumes. Bristol: Elm Bank. ISBN 978-1-84150-846-7. Wikimedia Commons has media related to Henry IV of France.